Bowman 36, long keeled sloop. A true “stop and look back” boat. This is a very rare example of the classic Holman and Pye design, which won the London Boat Show cruiser award in 1970. Built of GRP to Lloyds 100A1 specification, in 1971 by Southern Boatbuilders Ltd., Burlesque is designed for comfortable long-distance cruising. Accommodation is a versatile three cabin arrangement, providing double or single berths. Internally the boat is very light and airy with coachroof windows and four toughened deck hatches. She has the added benefit of a lifting keel, so at the end of the passage it allows you to creep into beautiful uncrowded places few boats of her size can go. 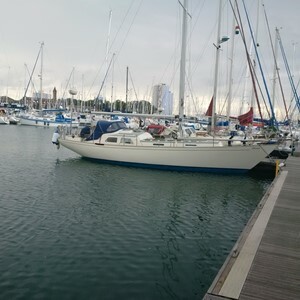 Burlesque is currently fitted with a furling headsail and the mainsail, whilst having traditional slab reefing, has a Pack-a-Main system and lazyjacks to aid sail handling. With new artificial teak decks and an abundance of varnished teak throughout the vessel she really is a delight to cruise on board.